Stretch Goals Announced! Add-Ons Explained! Boss Monster gameplay video now live! Good evening, Kickstarters! It's time for two announcements that a lot of our backers have been asking for: stretch goals and add-ons. We have promised great stretch rewards, and we hope you'll like what you see here. It starts to kick in at $20,000 -- a goal that is crazily within our reach. Check out the chart! We will add four new Kickstarter-exclusive Boss cards for everyone who pledges at the $25 and above. So not only will you get the Golden Dragon and some great digital goodies, you'll get four new Boss Cards to add variety to your game. 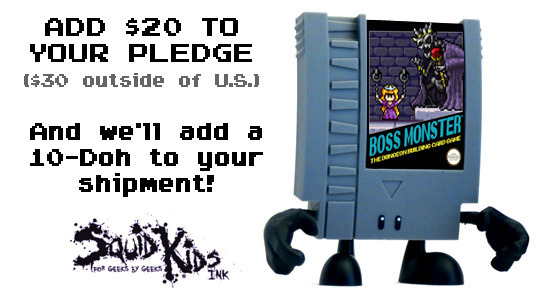 If we hit this level, we will also unlock a new pledge level: The New Boss! It's something a lot of people have asked for -- another way to put themselves in the game -- and it will be available at $300. No matter what, we're planning a very high-quality print run with Panda Games Manufacturing. But if we can hit $25,000 we will invest even more into the game. The cards will be upgraded from graycore to bluecore, which means they'll be more durable and feel better in your hands. This is a reward that will improve the play experience of every single backer! We'll also be improving the quality of the box with slick spot UV printing, to make your first-edition Boss Monster package even more of a collector's item. If we hit $40,000 and beyond we will be able to re-invest our proceeds into accelerating the development of a full expansion in 2013! This expansion is already in the early stages of development, but we will commit to Kickstarting it in 2013, and providing an early print-and-play copy for every Boss Monster supporter with Playtester status (anyone who has pledged $40 and above). We can't say much about the theme of this expansion yet, but if our funding hits the sort of peak we're hoping for, there will be no barrier to creating it! We're holding off on setting all the levels, since we're still getting a sense of how big this could be! We have some already in the planning stages, but your suggestions can still help guide us. Everyone has different rewards that would motivate and excite them, so please post your thoughts below! Our goals are to find ways to reward players who pledge at higher levels, to maximize the gameplay experience for our first release, and to invest in continuing to grow the Boss Monster game system. 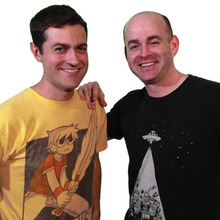 Kickstarter doesn't currently allow one account to select multiple pledge rewards, but if you want to double-up on a pledge, we can make that happen! For any non-limited pledge level, just add the cost of that level (including shipping) to your existing order and send us a message. We will add it to your order! Example: If you want two Power-Up Packs, select that option, then pay $60 ($80 if you live outside of the U.S.) and you will get two sets mailed to you! If you want a Mini 10-Doh, we are adding a new version only available during Kickstarter. This is a limited run that will never be produced again after this campaign ends. Just add $20 to your order ($30 outside of the U.S.) and this awesome figure will be shipped to you! For more on So Analog! figures and to get a look at the limited edition packaging, visit Squid Kids Ink! So that's the news for now! We are on track to make all of these stretch goals happen if we keep up our momentum, so keep spreading the word, Liking these updates, and maybe even increasing your pledge amounts to tap into these bonuses! Thanks for all your input so far, and we'll keep the updates coming. Hey there, Boss Monsters! Since we announced our campaign, one of the most frequent requests has been for a video of gameplay. On the main project page, we have shared links to the full rules and a Boss Monster 101 article that covers the game's core mechanic of dungeon-building. We recommend that you skim at least one of those to get a sense of the game's rules. But for a more in-depth look, here is a video that shows you how the game is played. Check it out! In the comments section, let us know your thoughts and questions! We'll be back online tonight to answer them. And stay tuned to our Kickstarter page over the course of our campaign for more card previews and gameplay articles.